While the whole world was watching, this is what Chicago's finest did. 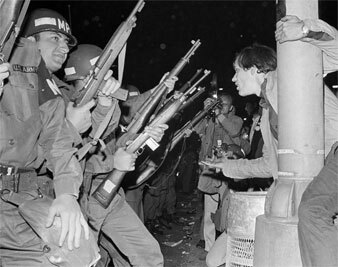 AP IMAGES Jeers greet National Guardsmen as they attempt to disperse demonstrators outside the Conrad Hilton. Thomas W. Pew Jr., editor of the Troy Daily News, offers his observations of the brutal beating of protesters he witnessed outside Chicago’s Hilton Hotel during the 1968 Democratic Convention. The unprovoked blitzkrieg police attacks on the pacifist crowd and bystanders in front of the Conrad Hilton Hotel in Chicago on the third day of the Democratic convention can adequately be compared only to the Nazi use of Black Shirts during Hitler’s rise to power in Germany. In the Hilton assault it is significant to report that the victims included guests of the hotel, elderly bystanders and women and children who had the misfortune to be standing behind the police barriers outside the picture window of the Haymarket Inn. After first assaulting the pacifist demonstrators, the police turned on this group of witnesses and pressed their club-wielding attack so severely that, in panic, the bystanders pressed back until they crashed through the window. But their glass-spiked, bloody escape route was cut off inside when the police flanked them by running around into the restaurant and began beating the people who had fallen through the window. At this point one young man was dragged through the revolving doors of the hotel and beaten until his face turned into an unrecognizable mass of loose pulp. Another victim was forced into a partially opened section of the revolving door and beaten through the crack until he fell into a heap on the floor. He was then swept out of the hotel by a man pushing the door around. In Chicago, the law-and-order standard became particularly ironic when the great majority of the crowds that were being assaulted by the police remained true to their credo of nonviolence. Even veteran newsmen lost their cool and began screaming at the police from the safety of an awning that hung over the scene in the street. But even after the first line of protesters had been peeled off–by clubbings and knees to the groin–the next row remained firm and refused to defend themselves, with what few weapons the street is able to provide. Still the police pressed forward with their sticks, their well-practiced karate chops, and their boots until finally they themselves fell back exhausted with the efforts of their administered beatings. Soon afterward the Chicago police were replaced by the National Guard. Remarkably, the uniformed soldiers were cheered. The Orwellian factor in this practical example of the law-and-order fixation which is now being touted by the two major Presidential candidates, as well as by the Wallace-Daley types, is that in the name of law and order the basic freedoms of a large minority of people are being suppressed. In the name of law and order the police attacked peaceful demonstrators, putting down their right to assembly and halting their freedom of speech, and by brutal attacks on scores of newsmen they attempted to muzzle the press. If they did this while the whole world was watching, what might they have done if they had been off camera? If their unprovoked attacks were carried out with the intention of triggering a violent response from a nonviolent crowd, to what lengths might they have gone if the crowd had responded with violence, or even if they had defended themselves?